It's wedding season!!! I have already been to two this year! All this has me thinking about my own wedding and I can't believe it has been almost a full year since my wedding.... time flies when you're married to your best friend! Looking back at our wedding, I can't help but remember all the wonderful gifts we received from our family and friends. The outpouring of love was amazing. As time passes, I have taken note of some particularly useful gifts that have really become staples of our millennial lives. 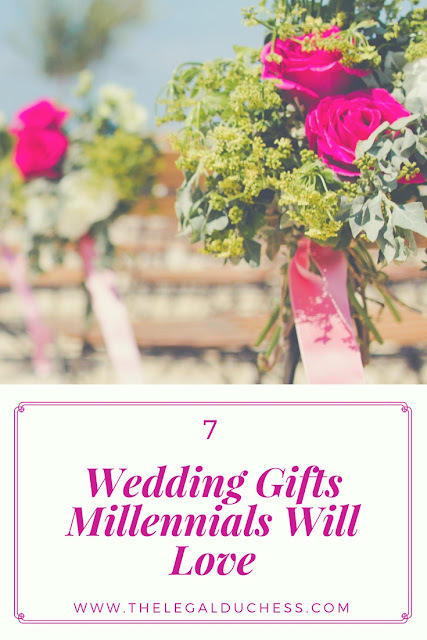 So here are 6 wedding gifts millennials will love. Good old fashioned cash... you can never go wrong. We got married right out of college and right after we bought our first house. Any cash we received helped us immensely to allow for honeymoon splurges or to buy curtains for our new house. Any young couple starting out can always use a little extra cash if you don't know what else to get. My Kitchen Aid is my favorite item in my entire kitchen. This is a great gift to maybe buy with a group of fellow friends to help out with the cost but to get the bride and groom an item they will use for the rest of their lives. It is a kitchen staple for a reason- you can use it for anything and everything and it just looks so darn cute sitting there. Mine is a soft turquoise and I am completely obsessed with it. This is a gift that you can't go wrong with! Millenials seems to be a synonym for coffee obsessed. I don't know many couples who wouldn't be ecstatic to receive a Keurig as a wedding gift. I personally use ours every single day. It;s another pricey gift but one which will be loved and appreciated for years to come. This is not a gift I received but it is my favorite type of gift to give at weddings. I look at the registry and pick a theme: baking, casseroles, coffee, etc. Once I have that, I pick out a handful of items related to the theme to purchase from the registry. Then I box everything up with a recipe or two for that theme. This could be my favorite baked goods recipes or my easy lasagna recipe or whatever fits the theme. I get so many texts from the couples thanking me for the recipes most of all. It is always fun to make a gift that is unique and slightly outside of the box. Any millennial would love it. Something we received as a wedding gift was a framed copy of our wedding invitation. I will forever have that hanging on our wall to remember our special day. Personal gifts like that are so special and so appreciated. A little thought and creativity can go a long way. One of our favorite gifts was a set of custom wine glasses that said Mr. and Mrs. Brown. As newlyweds, you get such a kick out of having the same last name and any gifts that highlight that are so fun and so special.